Roger de Anfrasio was 9 years old when the Nazis invaded his hometown of Dijon, France, beginning a chain of events that would lead to him becoming a French Resistance spy and young hero. Now 87 years old, he is sharing his story in a documentary and miniseries created by a couple newly moved to the Allentown area, James Arcuri and Lauren Levine. The film “A Garden of Thorns” is based on a memoir of the same name written by de Anfrasio to bring his living family members back together. 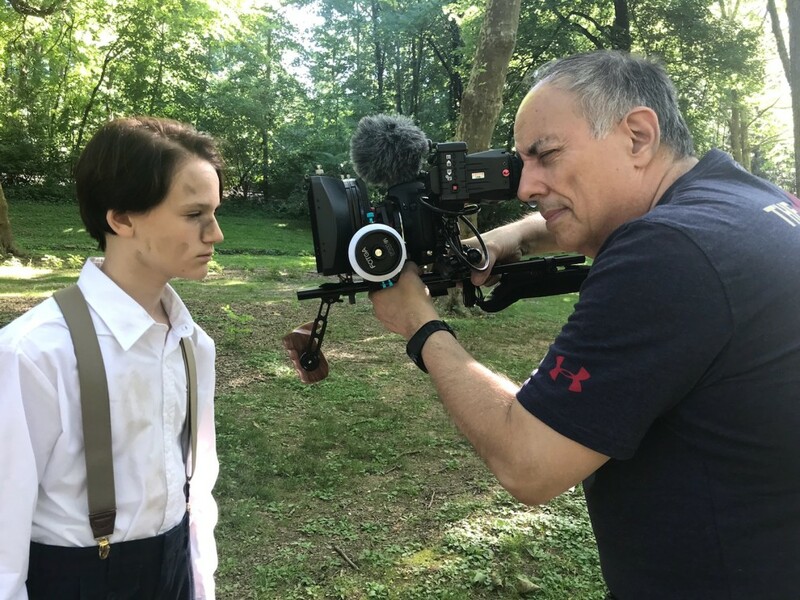 Producers/directors Levine and Arcuri of Identity Features motion picture production company are telling the whole story of de Anfrasio’s boyhood adventures throughout World War II. “Roger didn’t realize the scope of what he did – he didn’t do it to be a hero,” said Levine, who was inspired by de Anfrasio to the point that she sought acknowledgment for him from France, writing the government in 2010 when she and her husband optioned the book. She was incredulous to receive a call back from the city of Dijon, France, saying that de Anfrasio was going to receive the Medal of Honor because the information he gave the French Resistance saved thousands of lives of both civilians, including many hidden children, and Resistance partisans. Part of his contribution was giving information that helped the French resistance blow up a Nazi convoy and Nazi supply trains, just ahead of D-Day. In an immediate response, the Nazis, in an effort to recover their cache of stolen supplies, called off the terrifying house-to-house searches and round-ups of Jews and the Resistance to focus strictly on commandeering more supplies before the pivotal battle. De Anfrasio was honored in France in 2011 in a ceremony followed by a military parade in which the French military honoring Les Libertaires and the Resistance marched down Le Rue de La Liberte, or the Street of Liberty, to the city hall that the Nazis once occupied. Levine was unable to travel to attend the momentous ceremony. While caring for her elderly mother, who was stricken with Parkinson’s disease and dementia, she was diagnosed with Stage 4 metastatic breast cancer. After undergoing a radical bi-lateral mastectomy, very intensive treatment, both chemotherapy and radiation, she is still working on film projects six years later. “God allowed me to live to tell these stories. That’s why I was born,” said Levine, who was given a citation of her own for her courageous cancer battle. In order to tell de Anfrasio’s story, Levine teamed up with her husband Arcuri, who has been a filmmaker for 45 years and has authored over 70 screenplays. After a failed escape attempt to Switzerland, the Nazis occupied the de Anfrasio house, forcing them to move into their tool shed. De Anfrasio’s mother was cooking for the Nazis, only to secure bits of discarded food for her four young children. As the Nazis began to crack down even harder on their French hosts, de Anfrasio helped Eisenberg obtain some food by meeting with him in a hidden place – a long-forgotten, abandoned garden. Hidden from sight by overgrown bushes, great vines and one enormous wall was a low, almost unnoticeable hole in the greenery. This garden, overgrown with vines, branches and unattended, became a garden of thorns, later used as the memoir and film’s title. This same garden also became a meeting place for the French Resistance. Food shared by the two young boys was mostly what little could be found or scrounged up. De Anfrasio, on a mission to find some food somehow for survival, at the age of 10 1/2, was caught pilfering canned food. He had gone to the Depot Perrigny to “take back a few things” for his family and Eisenberg that the Nazis were warehousing. These foods were stolen from the French people. Though still a child, he was tortured by the Nazis over a period of several days. They believed he was doing it to bolster Resistance forces. He was saved by quick and very clever thinking by his mother, who dressed up in borrowed fancy clothes to go to “pick him up.” Relieved to find him still alive, she hugged and kissed him, then, she beat him badly, causing the Nazis to think they were both crazy. They wanted to get rid of both of them. Grateful to have escaped death, Roger had no idea that his closest friend, Joeh, who was like a little brother, was about to face death himself. De Anfrasio wept when he remembered how the Gestapo arrived in Dijon and made a round-up raid at his school, sparing him because he was not a Jew, but tearing Joeh Eisenberg out of his arms. Of the 90 people taken by the Gestapo, not even one of them ever returned. Heartbroken, de Anfrasio was forced back to his seat by a teacher whose actions likely saved his young life. De Anfrasio returned home from school to find his father and older brother Tony taken to forced labor, leaving him and his other brother, Vincent, to support their remaining family. In the face of desolate poverty, de Anfrasio took a job sweeping up hair at the barber shop, which led to his involvement with the French Resistance. Ironically, his mother, seeking to keep him off the streets and out of trouble, placed him in the hotbed of contact of the French Resistance. One day, de Anfrasio stole a pair of German binoculars from a Nazi, who wanted him to shine his boots. Shortly thereafter, he started spying, writing things down on a memo pad which was supposed to be for his school work. Initially the Resistance saw Roger’s contributions as unimportant. At first it was, until he brought them much more detail. That information really paid off. After passing along this information, he became an official member of the French Resistance, unbeknownst to his family, who could have been killed for this very knowledge. De Anfrasio’s time in the Resistance was full of danger. One mission he recalled as a “suicide mission,” as it involved sneaking almost to the Swiss border to save two orphaned children of French physicists. Many missions included brushes with death including the time when he had a Nazi gun pressed to his temple. In the end, his contributions helped the French Resistance in myriad ways, which he is still discovering all these years later. In 2014, for example, he met a “hidden child” whom he had saved with his knowledge. Ater moving to the United States after the war, de Anfrasio became a naturalized citizen. He became a celebrity hairstylist known throughout the East Coast as “Roger of New York,” under contract with Columbia Pictures in Hollywood. This remarkable story inspired Arcuri and Levine to option the book for producing the film. After the 2012 murder of a rabbi and his family in Toulouse, France, they became even more determined to spread this story of fighting back against hatred and bigotry. “After Toulouse, I started seeing anti-Semitism in more and more places. I feel I have to tell these stories,” Levine said. The couple moved to Allentown recently, in the interest of filming this movie and others. “A Garden of Thorns” features local actors like Zane Childs, who is cast to play Roger at a young age. His sister, Willow Childs, is cast as a Roma gypsy who helps the French Resistance. “There are good opportunities for filmmaking here,” said Arcuri, after their move from Long Island, New York. In the upcoming years, they hope to develop other local programs like a film camp and a hands-on film school. Levine, in particular, hopes to focus on creating programs to encourage participation in Jewish life. For more information about these projects, contact Lauren Levine at (646) 725-4000 or laurenlevine@identityfeatures.com.